We ordered a Spicy Scallop Roll (upper right corner), Kanpyo (pickled gourd and egg) Roll (below Scallops, mid right), Yellow Tuna and Avocado Jalapeno Roll (bottom right corner), Calamari Tempura Roll (bottom center), and a BBQ Dragon Roll (snaking up from the bottom left corner). Food: Excellent. My favorites were the BBQ Dragon Roll–the combination of the sweet and tangy BBQ eel with the smooth and creamy avocado was to die for. If you haven’t ever tried a scallop roll try it here–the scallop is slightly cool and tastes sweet and buttery. It feels like it melts on your tongue, which contrasts really well with the crunchy tempura crumbs dusted over the roll. Whether you like to go light or heavy on spicy mayo, you’ll be happy here–it’s very light in the rolls themselves, but your server will bring out a large dish of the sauce with your order, so you can apply the amount you like. Drink: We irreverently used Diet Coke to wash down our meal, but I noticed they had a great Sake selection that I’m looking forward to sampling next time. Service: The wait staff was very attentive and our food came out quickly. I was warned to expect a lengthy wait time, as this is known to be the place for sushi. However, I had the opposite experience. I made a reservation online for 8:15 on a Tuesday night, and when we arrived we were seated immediately. In fact, the restaurant wasn’t that crowded. 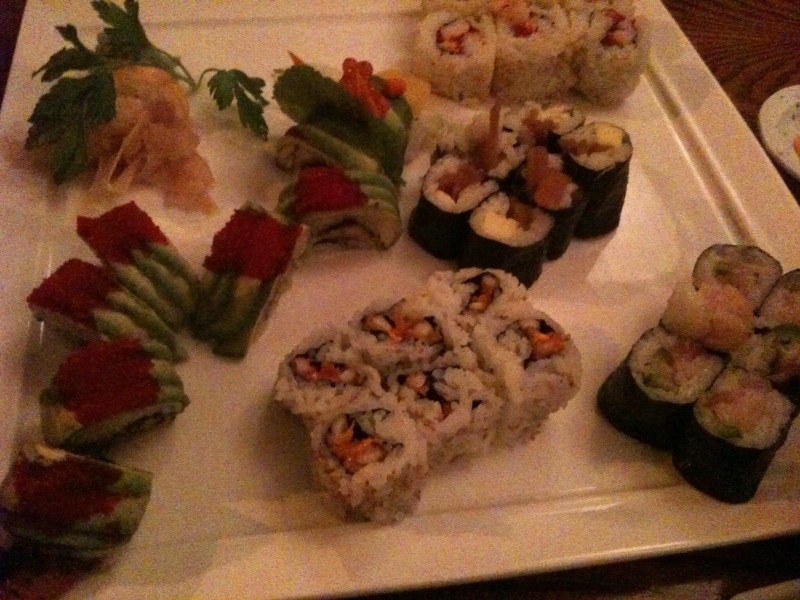 I’d recommend trying Japonica on a weeknight after 8–hopefully you’ll have the same luck I did. Scene: The décor is very low key–nothing fussy about the place. There are some paper lanterns hanging over the sushi bar and a few Japanese prints on the walls, but there’s not much else to say. Everyone around us belonged to the after-work crowd. The tables are well spaced, leaving more “breathing room” than the typical NYC restaurant. Dress: If you go on a weeknight like we did, no need to primp. Whatever you wore to work or jeans and a t-shirt will do fine. You could throw on a statement necklace to show that you made an effort, or not; this is not a stuck up crowd. Cost: We split the bill, which came to $35 each with tax and tip. For a place that’s known to be on the pricy side, I was pleasantly surprised. Delivery Area: 4th St. to 17th St., Third Ave. to Seventh Ave. If you like, try… Momoya. Like Japonica, it’s fantastic sushi without the Nobu scene.